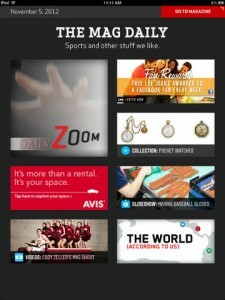 ESPN The Magazine App was designed to provide a pure reading experience for ESPN The Magazine content on the iPad. As well additional materials such as surplus photos and video content were developed for the iPad. My role on this project varied greatly through out the lifecycle of the app. I worked internally for ESPN where we had an External Design Partner and an External App Developer. I started as a back end information architect and feed developer. Upon completion of those initial tasks I was put in charge of project management from the ESPN side, ensuring an on time go live. Upon launch I quickly took on the duties of a Product Manager, overseeing the long term roadmap of the product and ensuring app updates proceeded according to the plan.